The Spendor ST is a distinctive high performance loudspeaker for discerning individuals. Beautifully styled with a gently curved shimmering black piano lacquer cabinet, the sophisticated modern look and individual character of each ST is enhanced by a luxurious fascia inlay. For the ST we developed a new Spendor 18cm Kevlar composite cone bass driver and a new 18cm polymer cone bass-mid driver. Combined with a wide surround 29mm tweeter and meticulously refined crossover network, the result is outstanding sound quality and superb technical performance. Down to the last detail the ST is engineered without compromise. From the machined steel stabiliser disks to the proven Spendor linear-flow reflex system, the sound is seamless, controlled and consistent. The new Spendor A3 is an ultra compact high performance floor standing loudspeaker. It delivers clear natural sound with real low frequency power and scale. It incorporates advanced drive unit technology and cabinet engineering from the highly acclaimed Spendor SA1 and A5 loudspeakers. Powerful electromagnetic damping of the Spendor bass drive unit and an optimised low Q acoustic enclosure, with a large diameter free flowing rear mounted reflex port, ensures deep well-controlled bass in any listening room. The 15cm bass-mid drive unit is designed and manufactured Spendor. With cast magnesium alloy chassis, ep38 polymer cone, phase correction technology, and a long throw high linearity minimal thermal compression motor system, it ensures a beautifully clear and natural mid range sound with excellent low frequency power handling. The drive unit has a very even and extended high frequency response. This allows the crossover frequency to the tweeter to be set very high, beyond the frequency range in which the ear is sensitive to transition effects, which ensures seamless sound and a clearly defined stereo image. The 22mm wide-surround tweeter combines the extended frequency response of a small diaphragm with the low frequency characteristics of a larger diaphragm to give stable low distortion response over a very wide frequency range. A phase linear crossover network integrates the drivers seamlessly. The crossover is mounted on a non-resonant panel which incorporates insulated gold plated terminals. High linearity audio grade capacitors and an easy to drive 8 ohm load ensure uncompromised performance and complete compatibility with a wide range of amplifiers and cables. Timing is fundamental to the musical experience. In conventional loudspeakers rigid high density cabinet panels are mass-damped to reduce cabinet-talk. Spurious energy is stored and released slowly. This introduces unacceptable blurring and slowing of the sound. Spendor's solution is asymmetric aperture bracing of the cabinet and Dynamic Damping. Asymmetric bracing disperses internal standing waves. Dynamic Damping uses small low mass constrained polymer dampers at key energy interface points to instantly convert any spurious energy in the cabinet into inaudible heat. The result is a naturally fast and engaging sound. The base of each A3 cabinet has four machined steel stabiliser inserts. These contribute to the neat appearance and good stability of the slim cabinets. The stabilisers are secured directly into the main structure of the cabinet so that micro-movement or flexing of the plinth and feet (which can blur fine detail and destroy ambience) is eliminated. With clean modern styling and natural veneer finishes the new Spendor A3 will blend comfortably and confidently with any room décor. Available finishes are light oak, dark walnut, cherry and black ash. The plinth is finished in contrasting black satin lacquer. The Spendor A5 offers exceptional performance in relation to its compact dimensions. New drive units based on technology developed for the recently launched Spendor SA1 ensure clear and natural mid-range and a beautifully open treble. The new 15cm drive units have a magnesium alloy chassis to support the long throw motor system which helps to give these loudspeakers a remarkably big and powerful sound. The fluid cooled 22mm wide-surround tweeter completes the driver array. The linear flow reflex port system allows the A5 to be placed in relatively close proximity to rear walls with minimal interaction, and the structural spike support system provides solid clean bass response. The large section linear flow reflex port reduces air velocity and port turbulence giving extremely linear and unrestricted low frequency response. The high quality WBT terminals and Spendor short signal path, low resistance gold crossover network are combined into a monobloc assembly that is anchored directly to the cabinet structure. The ultra rigid cabinet with Spendor's dynamic damping system gives super fast response, whilst high linearity components, silver plated cables and Spendors machined stabiliser system all contribute to the unrivalled sound quality. 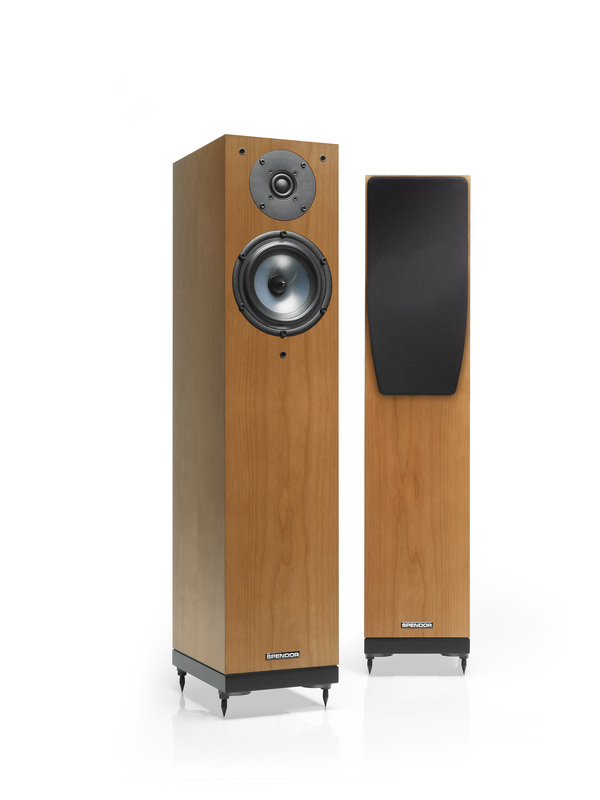 The Spendor A9 is a full-size 3-way floor standing loudspeaker. It has the resolution, dynamic range, and low frequency extension to realise the breathtaking detail which the finest digital media servers can now deliver from well-recorded hi-resolution uncompressed audio source material. The wide-surround tweeter with bi-elliptical acoustic lens technology is combined with a new Spendor 15cm mid-range driver and two specifically designed 18cmKevlar® composite cone bass drivers with magnesium alloy chassis and advanced motor systems. Spendors proven dynamic damping system reduces cabinet resonance to a minimum, whilst the fourth generation Spendor linear flow port guarantees consistent high quality bass in almost any room. For over two decades Spendor was licensed to manufacture the legendary LS3/5a BBC mini-monitor loudspeaker. It became an international reference standard. In 1998 when Spendor learned that manufacture of the LS3/5a drive units was to cease, we decided to develop our own 140mm (5inch) bass-midrange drive unit using modern materials and technology. Combining this with a small 20mm soft dome tweeter, new crossover engineering and a more up-to-date look we created the Spendor S3/5. Many listeners consider it to be the most transparent and truly musical mini-loudspeaker they have ever heard, and the S3/5 has won many awards. The latest 'R' type continues to build on the legend. Compact with high power handling and a natural sound that belies its size, the Spendor SP3/1R² draws together some of the most advanced features of Spendor designs resulting in a compact, high quality monitor loudspeaker. Loudspeakers of this size normally have difficulty in delivering a consistent sound across the frequency range, adding unnecessary colouration and dynamic inequalities to the stereo image but this is not the case with the Spendor SP3/1R². The latest R² version features a new bass/mid driver with an uprated voice coil and linear flux motor system. A low velocity large area reflex port compliments the improved low frequency alignment. Our wide-surround tweeter now brings a new level of clarity to this classic design. Without compromise to design or audio specification, the latest Spendor SP2/3R² demonstrates the same silky smooth, neutral sound which has made it's big brother, the SP1/2R such a favourite with professionals and music afficionados the world over. Housed in a more compact enclosure, the SP2/3R² is capable of dealing with the kind of demanding and revealing programme material that often defeats lesser loudspeakers. As with all Spendor models, the beauty and true virtue of the SP2/3R² is in what it doesn't do: there are no unnecessary distortions, colourations or dynamic inequalities which detract from the listening experience. The latest wide-surround small dome tweeter brings all the advantages of a large dome whilst maintaining the phase stability of a small dome. The Spendor SP1/2R² offers a unique blend of audio quality, tonal accuracy, razor sharp stereo precision and craftsmanship. A product derived from many years of development in drive units, crossovers and cabinetry. A speaker which wears it's heritage with pride. Directly descended from the much praised and critically acclaimed Spendor BC1, the SP1/2R² maintains the former's dimensions and uncanny mid and upper range accuracy at far higher sound pressure levels, with increased sensitivity, closer control of bass frequencies and lower mid-band colouration. It effortlessly meets the challenge set by infinitely variable listening conditions and offers consistent, faithful and neutral sound reproduction. Presented in a superbly veneered enclosure, the Spendor SP100R is an evolution of the S100, S100P and SP100 loudspeaker systems. These have been recipients of numerous awards: the prestigious French Diapason d'or and the Japanese 'Component of the year' accolade to name but two. This was just the beginning as the speaker evolved with Spendors ability to design and build our own drive units to exactly match the acoustic requirements of the enclosure. The SP100R continues to set the standard by which other loudspeakers are judged. The SP100R is a testament to Spendor's unique understanding of cabinet design. Critical positioning of the drive units and internal enclosures control and reduce unwanted resonances to an absolute minimum.